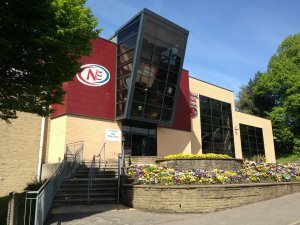 Dronfield Sports Centre, operated by North East Derbyshire District Council, is conveniently located at the Civic Centre (Postcode : S18 1PD) close to Dronfield Town Council offices. Facilities include a 60 station Health and Fitness suite, two swimming pools and Sauna suite. Football - Coal Aston x2 full size, Dronfield Woodhouse x1 full size, Stone Low x2 full size (leased to Dronfield Woodhouse). All can be booked through the Civic Office. Coal Aston - 4 changing rooms / refs room / toilets; Bowling pavilion with tea-room; the same facilities are available at Dronfield Woodhouse and tearoom. Dron wood crick changing room tearoom and pavilion. Stone low football changing rooms with showers. Cricket pavilion upstairs.